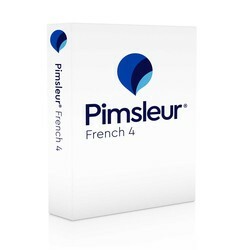 Builds upon skills taught in Pimsleur’s French Levels 1-3. You’ll be speaking and understanding French with near-fluency and with a broad range of conversational skills. In Level 4 the pace and conversation moves more rapidly, accelerating exposure to new vocabulary and structures, and approaching native speed and comprehension. 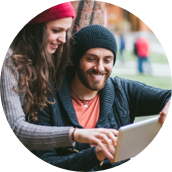 You’ll learn to speak about your professional and personal life, needs, likes and dislikes, and to create complex sentences discussing the past, present, future, conditional and subjunctive. - Business: Traveling for business, attending a conference, booking and canceling train tickets, looking for and buying a house in France. - Personal life: Discussing where you’ve lived, what you enjoy, going through hard times, marriage and divorce, raising teenagers, missing loved ones, moving. - Activities: Reading, hiking, gardening, skiing, going to the theater, watching TV, walking around, doing home renovations. - Shopping: trying on and buying various items of clothing, asking for colors and sizes, buying gifts and souvenirs, going to the open-air and the flea market, haggling over prices, negotiating a discount, discussing shipping options. - Vacationing: going to the beach or swimming pool, sampling foods, preparing a picnic, boating, dealing with crowds. - Dealing with Unforeseen Events: feeling ill, calling a doctor, losing or forgetting personal items, being caught in a strike, witnessing a crime, falling in love. - The French Character: Learn to think like a French person, using irony and sarcasm, making huffing sounds, showing nonchalance and disinterest, and expressing nostalgia and fatalism. After Lesson 30, a short story broken down into 20 manageable segments (over one hour) is provided for practice reading French.